Jesus is the only acceptable Substitute for the penalty of our sin. 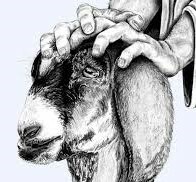 As the first goat became a sin offering, which was slain for the sins of God’s people, so Jesus took upon Himself our sins. He was punished in our place. He willingly became the propitiation for our sins; that is, He appeased the wrath of God that was meant for us. Jesus is the only acceptable Savior from the power of our sin. As the second goat became the scapegoat, which was sent into the wilderness after the people’s sins were placed upon it, so Jesus is our scapegoat. Through His sacrificial death and triumphant resurrection, He has taken our sins away, setting us free to now live in consecration to God. Forgiveness and freedom are now available to every sinner who will cry out to God through faith in Jesus Christ? Do you know Jesus? NOTE: Our church now has a sermon channel on Sermon Audio. Current and past sermons are being uploaded weekly. If you know anyone in the Cleveland area who is looking for a faithful church, encourage them to visit Cornerstone Community Church in Mayfield Heights (eastern suburb).